‘Water crises’ is recognised as one of the top 3 critical global risks by the World Economic Forum. In addition water scarcity, as has been recently demonstrated in countries such as Brazil and the US, can have significant implications for economic productivity. In 2015 the California drought cost $2.7 billion and shaved 0.1% off California’s GDP. The 2015 drought in Brazil is predicted to have cut GDP growth by 1-2 %, pushing the country into negative growth and contributing to inflation. * What does this mean for investors (portfolio risk) and banks (lending activities)? * How is the sector dealing with these risks? 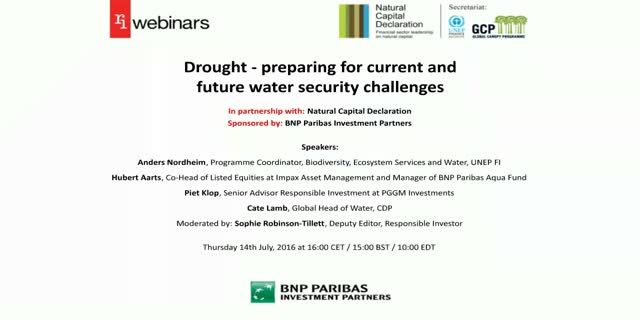 * Is it possible to create a drought resilient finance sector? * And what are the implications for banks, pension funds, insurers etc. ?